Are you a fun-loving family looking to get healthier but struggling to find ways that work for you? Are you a fun-loving family looking to get healthier but struggling to find ways that work for you? A brand new BBC1 show is on a mission to help us all live better with quick & easy fixes. KEO Films is widely regarded as the UK’s top independent production company with a long history of making award-winning documentaries. Notable awards to date include BAFTAs for Hugh’s Fish Fight (about trying to protect our oceans) and Welcome to Lagos, as well as an Oscar nomination for Exit Through Gift Shop. One of their most recent series on BBC One is ‘Britain’s Fat Fight with Hugh Fearnley-Whittingstall’ which looks at ways to tackle the health epidemic in the UK. They are now working on a brand-new BBC1 show called ‘100 Ways to Live Better’, with Hugh Fearnley-Whittingstall and Steph McGovern, a series that aims to give us tips and easy fixes to dramatically improve our diet, lifestyle and mental well-being. They are currently looking for people that are looking to get healthier but struggle to find ways that work. If this sounds like you, then get in touch and find out how they might be able to help you! 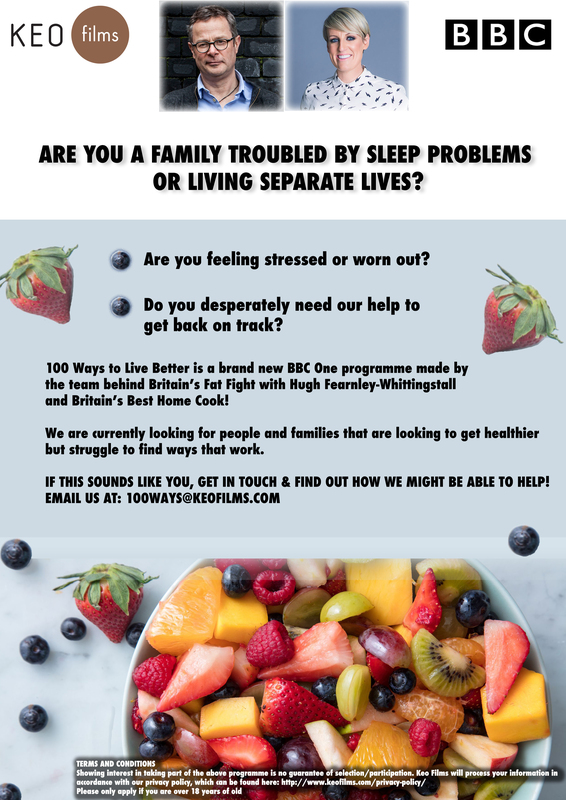 More specifically, they are looking for families who are stressed with a lack of sleep, teenage kids are constantly on social media or who are living separate lives! Email: 100Ways@keofilms.com for more information.